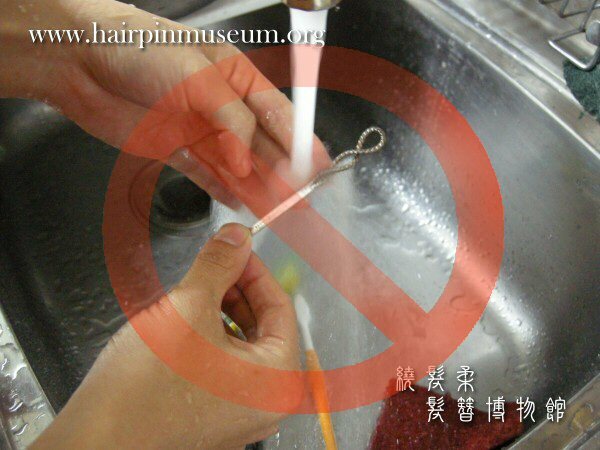 The case below shows incorrect ways to clean an old hairpin. 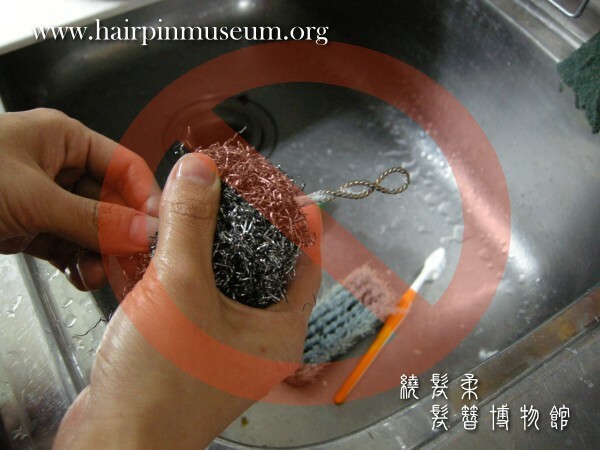 Some people like to do "Kitchen Conservation" or "Bathroom Conservation" at home to clean their antique jewellery. They use cleaning agents that are easy to find in their kitchen or bathroom, such as tooth paste or scouring pads. After they have finished their "cleaning" they are often quite satisfied with the results. Maybe you can do this kind of thing with a new object. But are you sure you want to do that to an old or valuable one? Old silver is much more fragile and delicate than new silver. 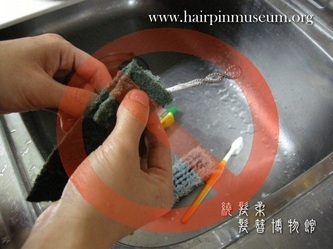 What you might use to clean your shoes is not suitable for your grandmother’s face because old skin is very sensitive. 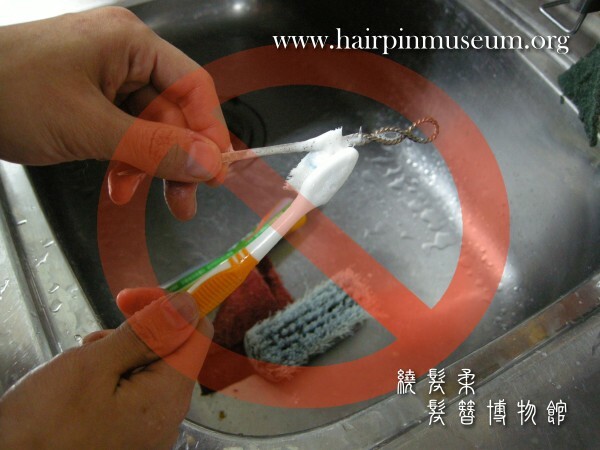 Some people use a toothbrush and toothpaste to clean dirty silver. After they clean it the silver looks very shiny! But, however good it looks there is always some invisible damage to the object. Toothpaste is designed for teeth, and many brands of toothpaste contain chemicals such a fluoride that are good for our teeth, and sweeteners or flavouring to make the toothpaste taste better. Toothpaste also contains a kind of glue – gum Arabic – and abrasive powders such as silica. But old silver is not teeth and the kind of chemicals in toothpaste are not always good for metals. The glue will also stick to the surface and be difficult to remove. After cleaning silver with toothpaste it is impossible to rinse the metal totally clean, there will always be some chemical left behind on the object. This can very easily cause damage the object by encouraging future corrosion, even if the damage is slow. Also after cleaning the silver with strong abrasives the surface becomes very shiny! It no longer looks like old silver and the object begins to look fake. 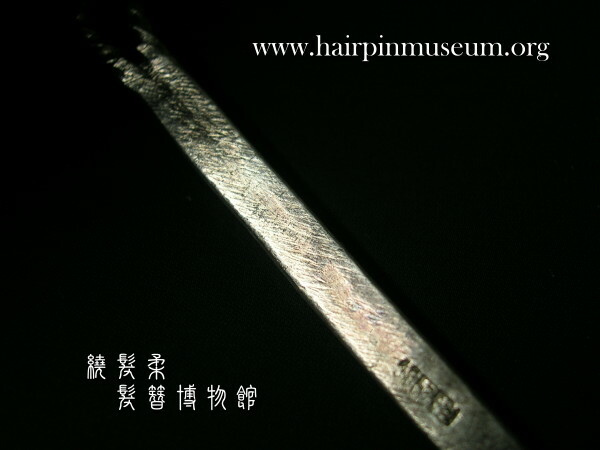 The pictures below show an example for a pure silver hairpin and several incorrect ways to clean it. 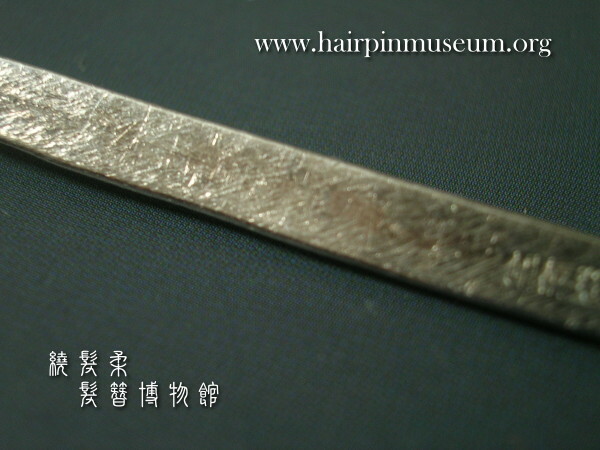 This is a new silver object (It was made in 2009) so no antiques were hurt in making this demonstration! 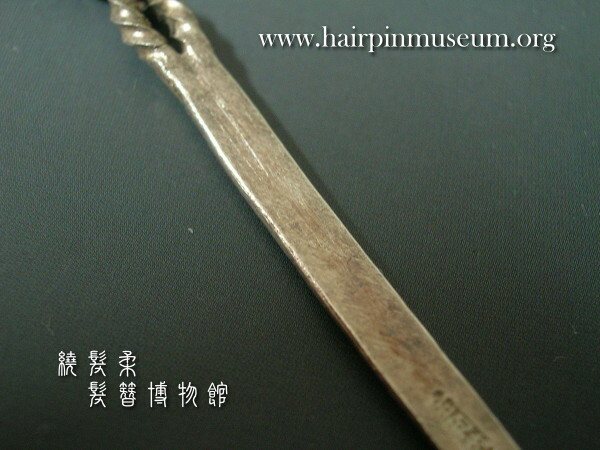 The methods shown below are not good ways to clean "old" silver objects. DO NOT USE THEM! The first picture shows a toothbrush and toothpaste. The toothpaste makes foam and bubbles that cover the surface being cleaned. It is impossible to see if the surface is being damaged. The second picture shows a steel scouring pad being used. This is bigger than the hairpin! How is it possible to see what you are doing? The steel is also much harder than the silver. 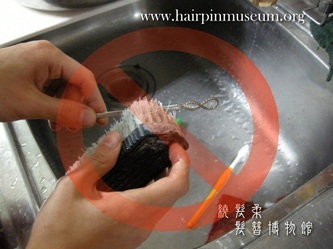 The third picture shows a plastic scouring pad. This also makes it hard to see what is being done to the object. 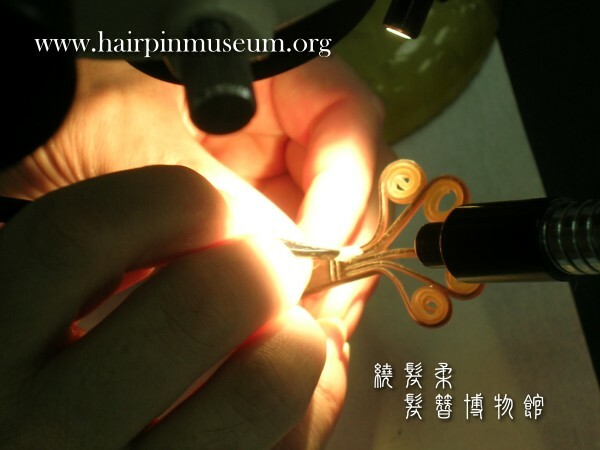 On an old, beautiful hairpin the plastic threads can pull pieces of decoration out of the surface. 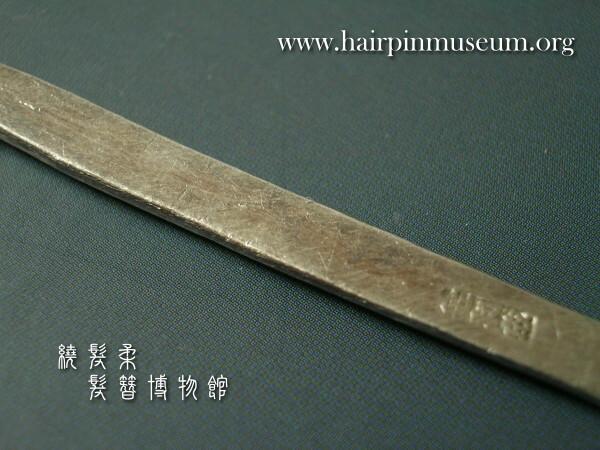 Even though it is plastic it is still too damaging to the silver surface. The next picture shows a large scrubbing brush being used. This is too big and heavy. The pin will become bent and damaged. The final picture shows the hairpin being washed under strong tap water. This is not a good idea. If there is a loose piece of metal or decoration then it may become washed away down the drain. It will be impossible to find it again! 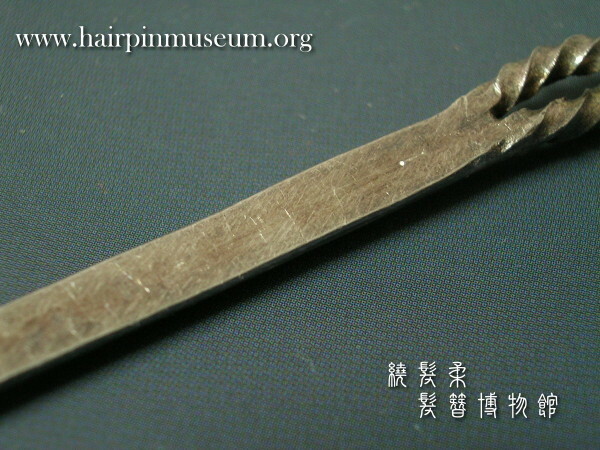 After the “cleaning” we can see scratches on the surface of the hairpin. These were not visible when it was being cleaned. With old silver the damage will be more serious. We should be very careful when doing any treatment on old objects or the damage may not be reversible. Any mistake will cause serious damage to the object. If possible all work should be done under a microscope with professional tools and chemicals. If you can not do this yourself why not let a professional do it for you? 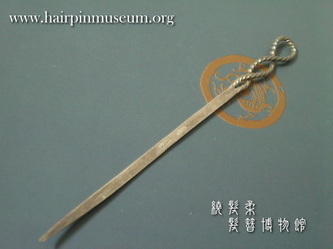 It is easy to find help in the museum or a conservation school. If the corrosion is not serious why not just let it stay there? The corrosion is a kind of the object’s history. It shows the object’s whole life. 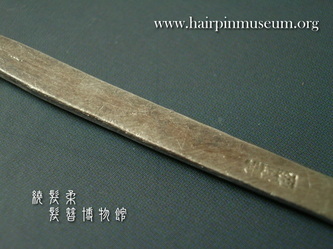 Here are two examples of the correct way to clean an old object. Left: Using a soft brush to remove the dust under a microscope. 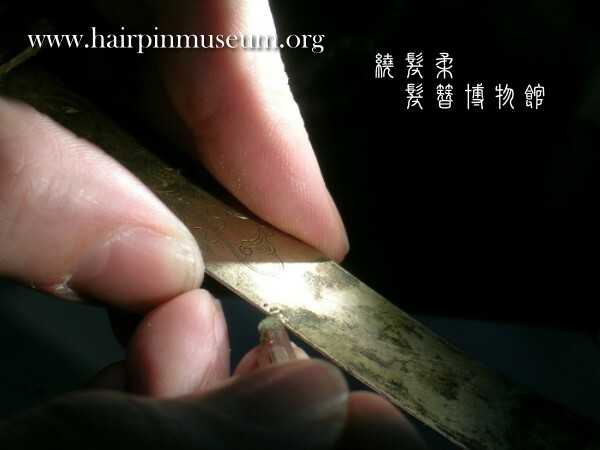 Right: Using a scalpel to carefully remove the corrosion under a microscope.